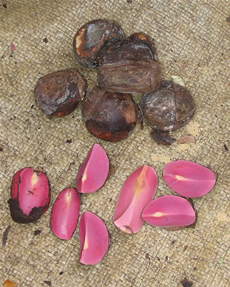 The kola nut, or bitter cola, (Cola vera, Cola acuminata, Cola nitida) is a seed part from a tree from the Sterculiaceae family. 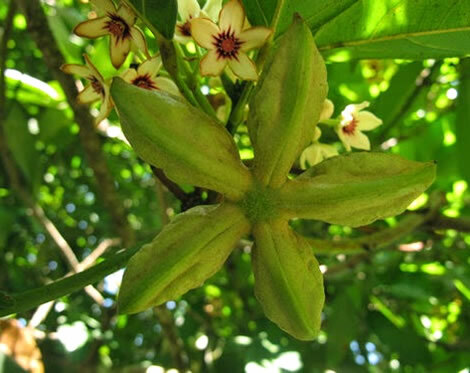 The trees are native to Central and Western Africa, but are now found in the West Indies and Brazil, where they were introduced by African slaves. All three species are used as a stimulant and are prepared in the same manner. The kola tree grows to approximately 40 ft (12 m) in height, and has white to yellow flowers with spots that range from red to purple. The kola tree’s leaves are 6–8 in long (15–20 cm) and the tree bears fruit that is shaped like a star. Inside the fruit, about a dozen round or square seeds can be found in a white seed shell. Kola nut, which contains high amounts of caffeine, helps combat fatigue and is most commonly used as a central nervous system stimulant that focuses on the cerebrospinal centers. It also contains theobromine, a stimulant found in chocolate as well as in green tea. Kola nut also contains tannins, phenolics, phlobaphens, kola red, betaine, protein, starch, fat, thiamine, riboflavin, and niacin. The Journal of the American Medical Association advocates the use of kola over other stimulants, because it is not addictive and does not lead to depression. Because kola nut is also a diuretic, its use has been suggested for those with renal diseases, cardiac or renal edema and rheumatic and rheumatoid conditions. Most people around the world are familiar with kola; many have tasted it and do not even know it. In the 1800s, a pharmacist in Georgia took extracts of kola, sugar and coca and mixed them with carbonated water. His accountant tasted it and called it “Coca Cola.” Today, Coca-Cola still uses kola in its original recipe. In Africa, the fresh nuts are chewed as a ceremonial greeting, as a stimulant, and to help aid digestion, as kola nut stimulates gastric acid production. Kola nuts are also known to improve the taste of food and act as an appetite suppressant. The kola nut is also used to treat migraine headaches, because the caffeine and theobromine act as cerebral vasodilators (increase blood flow in the head) and, when used in a poultice, can be applied to external cuts and scrapes. More recently, an ephedra/caffeine preparation made from kola nut extract and a Chinese medication known as Ma Huang was tested for safety and efficacy as part of a weight reduction program. The study indicated that the preparation improved the subjects’ rate of weight loss and reduction in body fat without undesirable side effects. The flavor of kola nut in cola beverages appears to be more effective than other flavors in disguising the taste of activated charcoal when the charcoal must be given as an antidote for accidental poisoning. The part of the seed known as the kola nut is the cotyledon, which is also called the seed leaf. The cotyledons are white and bitter when they are fresh, but they turn reddish with almost no taste when they are dried. Fresh nuts are difficult to find outside of the tropical areas where they are grown. Sometimes, the nuts are sold at African markets in international cities, like Washington D.C. The dried cotyledons are 1–2 in (2.5–5 cm) long. Dosage of kola nut should be 2–6 g per day, as 2.5–7.5 g of liquid extract or 10–30 g per day of tincture. Powdered cotyledons should be taken at 1-3 g per day, as a decoction, liquid extract, or tincture. For the decoction, boil 1-2 teaspoons in a cup of water and take three times a day. The liquid extract should be taken in a 1:1 solution of 60% alcohol at .6-1.2 ml three times a day. Tinctures in a 1:5 solution of 60% alcohol, with 1-4 ml of the cotyledons three times a day. Because of its use as a stimulant, kola nut should be used with caution. Patients should consult with their doctors, especially if they are taking other medications. Due to its caffeine content, kola nut should not be used by women who are pregnant or nursing a child. Also because of its caffeine content, it is not advisable for those suffering from insomnia or anxiety problems. In some cases, extreme restlessness and sleepnessness can occur. It should not be used by patients with a history of high blood pressure, heart trouble, palpitations, seizures, insomnia, heart disease, high cholesterol, or stroke. Research in Niger showed that the habitual chewing of kola nut can actually cause cardiac arrythmias, based on clinical trials using cats. Kola nut should not be used by those with stomach or duodenal ulcers because it increases gastric juice production and may add to gastrointestinal discomfort and disorders. 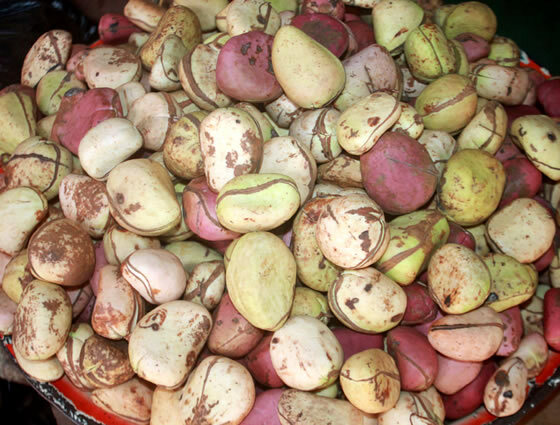 Kola nut is also one of the top ten common food allergens, among cow’s milk and chocolate. Kola nut is naturally very high in tannin, a white-to-yellow astringent powder that gets its name from its use as a textile and leather tanning agent. However, a University of Miami study shows that “tannins are increasingly recognized as dietary carcinogens and as antinutrients interfering with the system’s full use of protein” and called for more studies correlating early death and regular kola nut use in third world countries. Kola nut should not be used for long periods of time. Kola nut and cola beverages should be kept away from dogs, cats, and other domestic animals. The theobromine in kola nut (and in chocolate as well) can be fatal to these pets because they metabolize it much more slowly than humans. Kola nut may cause insomnia, anxiety, nervousness, gastrointestinal problems, and tremors. If there is any indication of an overdose, diarrhea, nausea, and/or cramps may follow. Oral blisters have also been known to form. Heavy use of kola nut or drinking large quantities of cola beverages has been associated with bone loss in adults and inhibition of bone formation in adolescents. Some practitioners are recommending that teenagers should restrict intake of soft drinks containing cola in order to lower their risk of osteoporosis in later life. Kola nut should not be used with muscle relaxants, heart medications, high blood pressure medication, nitrates and calcium-channel blockers. Clinical experiments indicate that beverages containing cola increase the rate and extent of absorption of carbamazepine (Tegretol), a drug used to treat epilepsy and some forms of bipolar disorder. Kola nut has been reported to interact with tricyclic antidepressant medications and with MAO inhibitors. In general, patients taking any medication for anxiety or depression should consult their physician before taking preparations containing kola nut.